"It's all about educating the public," he says. "Once they discover the differences, there's no turning back. Trust me, I can just about guarantee that Lucy and Ricky would have taken this route." FORT LAUDERDALE, Fla., July 8, 2014 (SEND2PRESS NEWSWIRE) — In the 1950s, Lucille Ball and Desi Arnaz gave into the romantic notion of cruising America’s highways and byways in “The Long, Long Trailer.” If they had to do it all over again, they would likely have been a lot better off in a luxury RV rental, says Allstar Coaches. Gone are the days of bumpy rides, junky kitchens and cramped spaces. Today’s RVers can spread out in style. And surprisingly when the cost of a luxury RV rental is compared to that of an average RV rental, the difference is minimal. However, when comparing the actual RV rentals side by side, it’s like comparing apples to eggplants. Rob Tischler, CEO of Allstar Coaches, says that it’s truly amazing just how much more you can get for just a little more money. Here’s a scenario to consider. A regular 19-foot class C Florida RV rental that accommodates up to three people goes for approximately $2,000 per week. However, for an additional $500, RV renters can get a 35-foot, class A luxury Florida RV rental for six people. “Seems like a no-brainer, doesn’t it?” Tischler says. Tischler says that the main reason more people don’t travel in a luxury RV rental is because they are not aware such an animal exits. So, what separates a luxury RV rental from the rest of the fleet? Luxury RV rentals are like hotels on wheels and come with an array of special concierge services too. So, for RVers who want to combine the adventure of RVing with the luxury amenities offered by five-star resorts, luxury RV rentals are the way to go. Founded in 2005, Allstar Coaches was created to fill a missing niche in the RV rental market – luxury recreational vehicle rentals. Strategic locations include: California, Pennsylvania, Florida, Arizona, Nevada, New York, New Jersey, Delaware and Maryland. 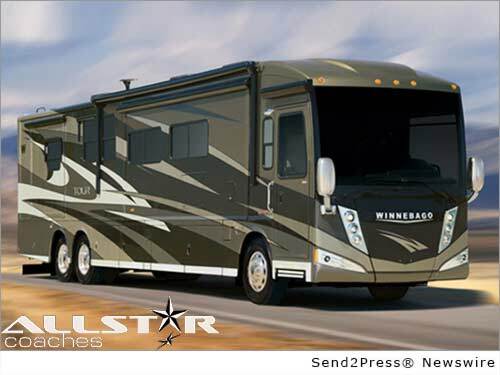 Allstar’s luxury RV rentals may also be delivered to locations around the nation. For more information, visit: http://www.allstarcoaches.com/. * Photo Caption: Allstar Coaches is the leading provider of luxury RV rentals in the United States. Original Keywords: Allstar Coaches, luxury RV rental, class C Florida RV rentals Allstar Coaches Fort Lauderdale Florida FORT LAUDERDALE, Fla.
REFERENCES: Automotive and Motorsports News, Allstar Coaches, luxury RV rental, class C Florida RV rentals Allstar Coaches Fort Lauderdale Florida FORT LAUDERDALE, Fla.